Forest Hill lives up to its name. And we took a chunk out of this one. This garden design Forest Hill Se23 was in much need of space at the rear of house, as it had no patio area or social space. The existing garden retaining wall for the only 1 m from the house made the interior feel cramped with the garden right on top of the living space . The object was to create a a lower courtyard garden opening the lower area. This project was going to be a real hard landscaping build with cast steel reinforced retaining walls and foundations. The walls had to be very strong so we cast concrete using steel reinforcement. 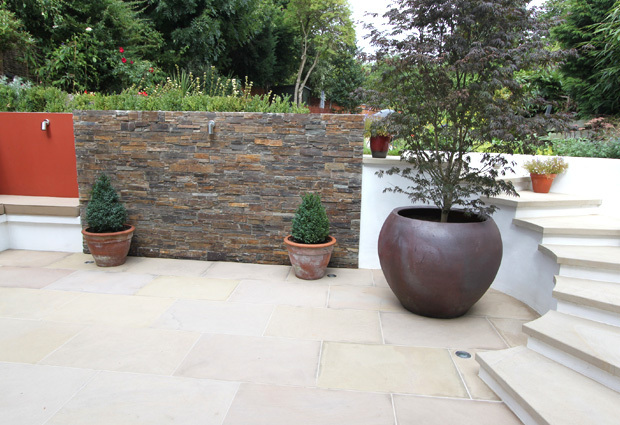 This garden design Forest hill was to have contemporary geometric outline but to be tempered using soft light sawn York stone paving and a rustic stone feature wall as focal point. 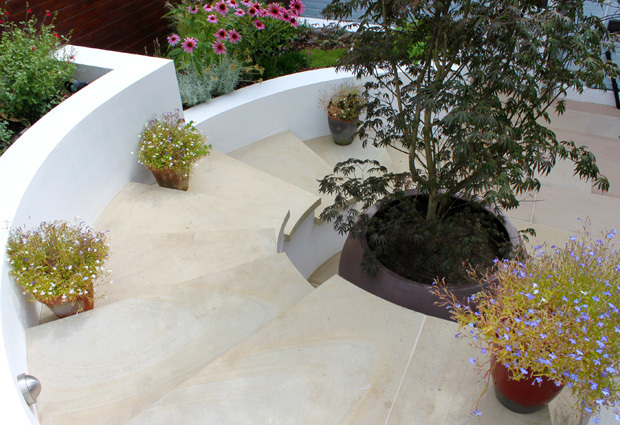 The stairs were also to be a real visual feature, sweeping, curving up into the upper area with the concentric theme endorsed by the large circular feature pot and Acer plant. 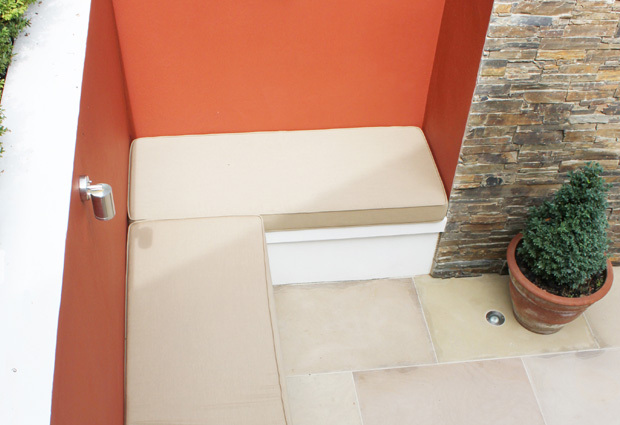 The recessed seating area, great for throwing some cushions down and getting the feet up .The rustic wall tempers and punctuates the more contemporary themes and brings visual interest to the space. Sawn York stone patio and staircase sooths and smooth’s, creating a fresh light and airy feel to this courtyard themed Design. I love staircases you really can create an Architectural statement. 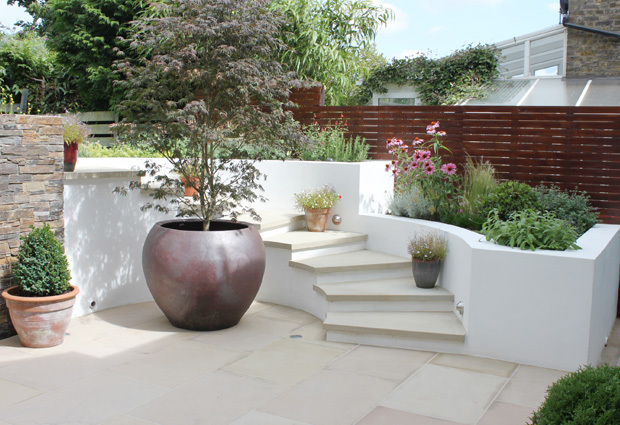 Garden design in London needs to be innovative, creative, and functional. 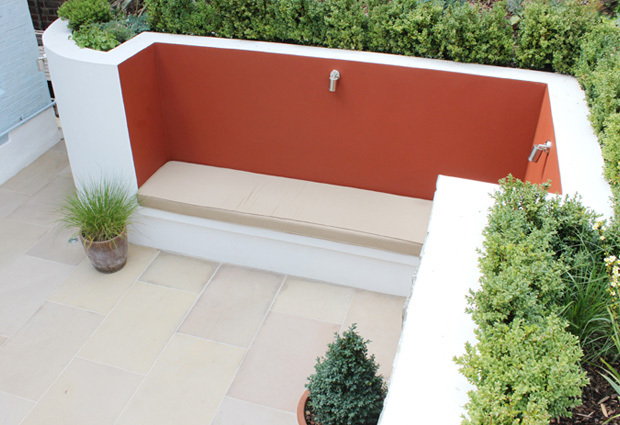 The London Landscaping Company offer a bespoke design and build service. 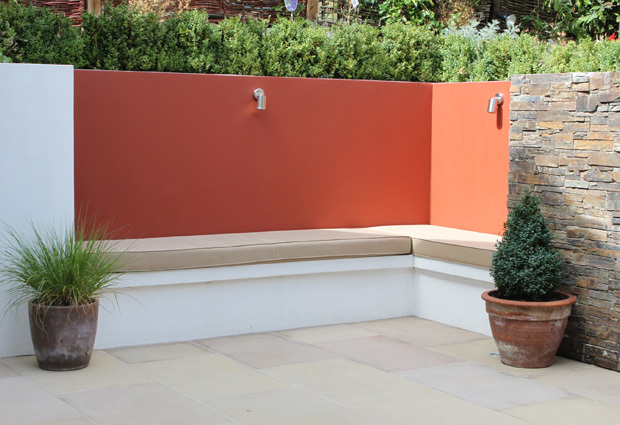 Feel free to get in touch to discuss your project whether an outdoor room , roof terrace, small court yard garden , large family contemporary garden , formal or traditional. 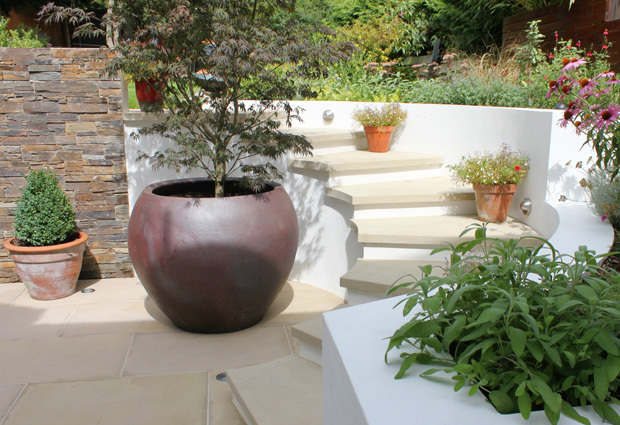 We will give a free consolation and site visit to help you realise your project .Our very friendly and professional in house team of garden designers and horticulturalist can take from initial concept through to design and build .